“Brown is better”. This statement is standard fare in the world of nutrition advice. We have all heard it – brown is the healthier option. But is it true? Is brown really better? Here is the answer to that question in relation to five popular food items. When we talk about brown rice, what we really mean is whole-grain. Whole-grain rice is rice which has only had the husk (the inedible outer layer) removed. Unlike white rice, whole-grain rice still contains the germ and the bran. The germ is particularly rich in oils, vitamins, and minerals, while the bran is rich in fiber and other nutrients. White rice has had both the germ and the bran removed, resulting in a nutritionally inferior product. Brown bread is a tricky one. Most consumers think that brown bread is healthier than white. However, bread manufacturers exploit that common assumption. They make white bread from wheat flour that has had the germ and bran removed (because most people prefer the way it tastes), and then color it brown with molasses or some other dark ingredient. They call it ‘wheat bread’ to confuse people into thinking they are buying the healthier whole wheat option, when in fact they are purchasing nothing more than a white loaf masquerading as its brown counterpart. Look at the ingredient list. The first ingredient should be “whole wheat flour”. If, however, it says “enriched wheat flour”, it is not whole-grain. Look for the name “whole-wheat” rather than just “wheat” bread. Regular pasta is made from wheat flour, so it follows the same rule as bread. As long as the ingredient list says it is made with whole-grain durham wheat flour, it is the healthier choice. Many people assume that the “brown is better” rule applies to eggs. This assumption is perpetuated by the fact that brown eggs are more expensive. That must mean they are better, right? Not in this case. 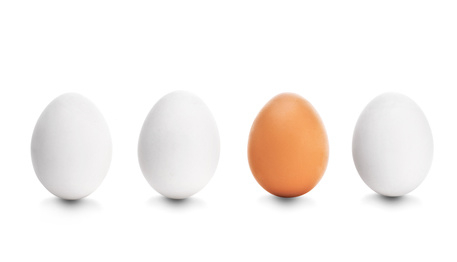 The color of an egg’s shell is determined by the breed of the hen that laid it. However, it has no impact whatsoever on the nutritional content of the egg itself. The reason that brown eggs are more expensive is because the types of hen that lay brown eggs cost more to raise and look after. White sugar is pure sucrose that is made by dissolving, concentrating, and recrystallizing raw sugar. Brown sugar is simply white sugar mixed with a small amount of molasses to make it turn brown. Molasses is the syrup that is left over once sucrose has been refined from sugar cane. While molasses does contain some iron, calcium, magnesium, and potassium, the amount is so negligible in brown sugar that is has no nutritional impact. For all intents and purposes, brown sugar is no better than white. As a side note, people in the United States sometimes think they are eating raw sugar. However, raw sugar is not allowed to be sold in the US because it contains too much dirt. The ‘raw sugar’ that people eat is actually made from evaporated cane juice. Thanks for posting this! I didn’t know that about sugar, I thought brown sugar was somehow raw or less processed and therefor better. Oops! I used to think exactly the same about brown sugar Brigitte.